All information processing in the human body is implemented by means of electro-chemical processes. The brain’s conscious or unconscious control of the “expressive” movements of our facial muscles is no exception to this rule. Our work explores how external electrical stimulation can replace the brain’s neural signals. We trigger the muscles of a human face by computer-generated electrical signals, applied through external electrodes to the nerves that activate the muscles (“Transcutaneous Electric Nerve Stimulation”). This method allows the creation of a wide range of “artificial facial expressions” which are often unusual and surprising. The electrically triggered human face thus becomes a new medium for kinetic art. For the Electric Lab exhibition we developed a new piece which shows the human face in a state of externally triggered resonance. 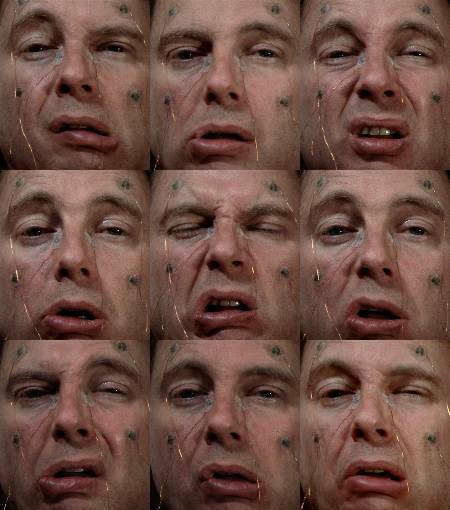 Eight facial muscles are subjected to a simple on/off stimulation pattern, with a repetition period that varies gradually between 2 seconds and 100 milliseconds. At fast stimulation rates, the external input looses its precise control of the muscle contractions: resonance patterns appear which are primarily determined by the intrinsic mechanical properties of the facial muscle system. The face thus displays its own mechanical properties on the face itself. A self-portrait of the face, manifested by its eigen-frequencies: an “Eigen-Portrait”. The sound-track of this work is a direct audio rendition of the electrical signals that are applied to the face displayed on the screen. Resonance is an important physical phenomenon. Electrical resonance is the basis for radio and television; mechanical resonance is the basis of most musical instruments. Every physical body has a particular resonance frequency (eigen-frequency), which depends on its shape, size, mass and elasticity. Resonance phenomena play a central role in Nikola Tesla’s work. Both his resonating voltage transformer (the “Tesla coil”) and the Wardencliff “free energy” experiment exploited the phenomenon of electric resonance. Our project zooms in on this conceptual aspect of Tesla’s thinking; at the same time it demonstrates the power of electricity in its interaction with the human body. Exhibited at Electric Lab, Exit Art, New York 20 September - 17 November 2007. Note: this non-profit New York art space has closed. Shock Art: Exit Art’s ‘Electric Lab’ show could use a little more voltage.